Andrew and I have been specializing in helping folks buy and sell horse properties in the Foothills, along the Front Range and throughout Metro Denver for more than 15 years. 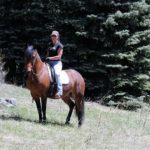 Because it is a specialty, and we target marketing to people around the globe, we often come across individuals who are new to the area, or are considering relocating here, and they are looking for a horse property. Either they currently have horses and are looking to bring them with them, or they desire to begin a horsey chapter of their lives, maybe one they have only dreamed of, and they will acquire the animals after they secure the right property. We learned years ago in the real estate business, that just because a property is advertised as “horse property”, that might not really be true. Sometimes it is simply a lack of experience and expertise on a part of the agent, or maybe the current owner has horses and has requested that the agent advertise it as such. At times an agent may assume that since a horse (or more) live on the property at present, the property is a “horse” property by common sense definition. Ignorance is no excuse, as they say, and even if a horse lives on a property today, the new owner of tomorrow may have no legal right to add one of their own after the transaction is completed. Zoning and any local municipality categories are a first step in your process. Each county and city or township groups properties into categories of use. A quick check with the zoning office, or usually online at a handy website, will not only help you determine what a certain property is designated – agricultural, residential, PD (planned development), mixed use, commercial, etc., but it will also provide you with zoning category definitions which will tell you not only if horses are allowed, but how many are permitted. To be honest, usually if horses are okay, the number of animals allowed is much higher than you would want to put there. 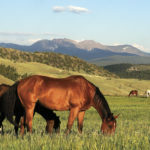 Last month’s article discussed legal water issues in more detail and if you missed it, and cannot find a copy of the December Serenity lying about, you can find that article here http://mtnhomes4horses.com/domestic-well-household-use-well/. In quick summary, all the water in the State of Colorado belongs to the People of Colorado, not the property owner. Even before official statehood in 1876, the right of use and to divert water in Colorado has been a big deal. A property owner may enjoy rights of use of water from a well, a reservoir, or stream for their horses. However, there may be a well, a reservoir and a stream on a property where it is absolutely illegal to use any of that water for horses. So, check on the source of water available and double check on it’s permitted uses. A water attorney is your most reliable resource, but an experienced real estate agent with education in sources of water can provide you with capable guidance as well. At times, restrictions have been placed upon a property or a neighbor that restricts the allowed uses on the property moving forward. Some of these restrictions, quite frankly, are inappropriate, outdated, and even offensive. But if not illegal, they can limit your uses of a property. A visit to the county offices again can be illustrative, but your real estate agent can work with local title companies to pull what is referred to as CC&’Rs – Definition of Covenants, Conditions & Restrictions on a property. A careful reading of these documents is an absolute requirement for anyone purchasing any property, but paramount for those thinking of bringing their horses. Beyond CC&R’s, any property located within a Common Interest Community (HOA) will have rules that limit and restrict an owner’s use and discretion over their private property. Some examples are types of animals, numbers of animals, types of fences, types of secondary structures (barns and pasture shelters), to name a few. HOA guidelines supersede county zoning and local guidelines. Even in cases where the HOA is considered “voluntary” and you are told you can “do what you want” is unwise to assume a dormant neighborhood organization will remain that way after you complete a purchase. A best practice is to submit any horse related improvements to the architectural review committee (or it’s equivalent) during your Due Diligence period to make certain you will be allowed to follow through on your plans after Closing. 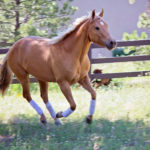 Finally, after considering Zoning Guidelines and municipal categories, Legal water, Definition of Covenants, Conditions & Restrictions (CC&Rs), and Common Interest Community (HOA) rules, a person with the best interests of their horse in mind must evaluate a property based upon what I call the “eye test”. In other words, is it a property where a horse will enjoy a safe and happy life? Eye tests considerations are aspects like sun exposure, grazing and exercise opportunity, topography and slope, ease of access for your truck and trailer, and evacuation options should a wildfire develop in the area. Sun exposure makes a huge difference in our area. Whether the property is south facing or north facing makes a huge difference in the speed of snowmelt, retention of icy build ups and opportunity to safely ride or even load your horse in the winter months. Think about the topography and make up of the land. Is there meadow for grazing? Is the slope of the ground gentle enough? What about spacing of rocks and trees? Unfortunately, we have seen instances where a property would be perfectly suited as a goat sanctuary, but not for a happy horse. 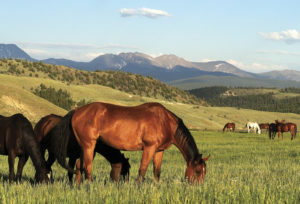 Some acreages with limited true pasture will benefit from a track system for exercise and replacement “grazing” (See my June 2018 article http://mtnhomes4horses.com/track-system/). For those of us living with horses in the Foothills for longer periods, we have experienced the scare of wildfires and calls for evacuation. Look at a property through the lense of how easy it will be to load them up and get them away to safety. Long narrow access roads might be adventurous at a leisurely pace in your four-wheel drive. But in times of crisis, you want easy access for truck and trailer with ideally more than one route in and out of the neighborhood. It is not fun to think about but planning your route today could save heartache at some point in the future. As mentioned previously, there are likely more considerations to be thought of when evaluating a property for horses, but hopefully this piece will help you start your checklist. Maybe having horses at home is a dream of every horse person. A thoughtful process at the outset will help you also fulfill your horses dream of where they would dream to live as well.